In a recent post, we reminded you of deadlines for various awards from the Association for the Study of Food and Society. It looks like we missed one that could be of great interest to SAFN folks who teach: the ASFS Pedagogy Award. Fortunately, the deadline has not yet passed, although it is coming soon: February 15, 2019. Teaching Food and Culture. Edited by Candice Lowe Swift and Richard Wilk. Walnut Creek, California: Left Coast Press, Inc., 2015. 209 pp. US$39.95, paper. ISBN 978-1-62958-127-9. In Teaching Food and Culture Swift and Wilk present a compilation of papers that use food “to transform research into pedagogy,” arguing that food is a productive medium to engage students in the core themes and topics of anthropology. One of the strengths of this volume is the editors’ commitment to all four subfields of the discipline; however, every author demonstrates a commitment to a holistic approach to teaching and research that is reflective of the trans-disciplinary nature of the study of food. Several authors specifically mention that assignments can be adapted to courses in a range of disciplines including gender studies, communications, public health, religion, economics, and history, giving the volume a broad readership. After presenting an overview of the chapters and the goals of the book in Chapter 1, Chapter 2 is an interview with the late and notable food scholar Sydney Mintz. The interview took place via email correspondence and is Mintz’ thorough responses to three questions posed by the editors of the volume. Section II of the book, Nutrition and Health, begins with a chapter on “Teaching Obesity: Stigma, Structure, and Self.” The authors of Chapter 3 describe the ways they use the topic of obesity to address key concepts in their upper and lower division undergraduate courses on anthropology and global health including poverty, discrimination, and responsibility. While they describe the sensitive nature of teaching obesity and problems that can arise in having students research and debate this topic, more concrete examples of how to avert these problems in the classroom would be beneficial. In Chapter 4, Sept describes how she structures her upper division archaeology course, Prehistoric Diet and Nutrition. Blending biological anthropology and archaeology she links studies of genetic change and the development of taste, with popular culture trends in food such as the paleo-diet. She details a related in-class scenario-building exercise that prepares students for debates on hunting and scavenging. After providing a brief history of the development of nutritional anthropology and the biocultural approach to food in Chapter 5, Wiley outlines the history and social life of milk. A detailed semester-long assignment presented in the appendix guides students through their own single-food project, yet the body of the chapter itself could be strengthened by more classroom examples. The three chapters of Section III: Food Ethics and the Public offer the most pedagogical insight with discussion of activities and student’s responses to these approaches. First Benson (Chapter 6) describes three different assignments he has used to emphasize the role of food in the study of consumption, explaining how they “…[have] students look inside themselves at their own issues of dependency and habituation as well as upward at the powerful institutions that make the myths and realties of consumption” (111). This balance is carefully analyzed in several other chapters including Chapters 7, 8, and 12 where the notion of linking research and praxis, and demonstrating how the personal is political are emphasized. In Chapter 7 Counihan describes her research and teaching that encourages her students to reexamine the places where food is produced, purchased, and consumed. Using Lancaster’s historic farmers market, she provides students with a central research question, “Does Central Market promote a just and community-building system of food production and consumption?” This guides students through ethnographic research on the intersections of food, gender, class, race, power, economics, and politics. Service learning courses that address these same themes are the focus of Chrzan in Chapter 8. By offering readers a history of her service learning courses, she describes her successes and failures, allowing readers to avoid these pitfalls in their own courses. The active ethnographic requirements of the assignments in these chapters illustrate how students learn to apply anthropology beyond academe in ways that also promotes food justice and democracy. 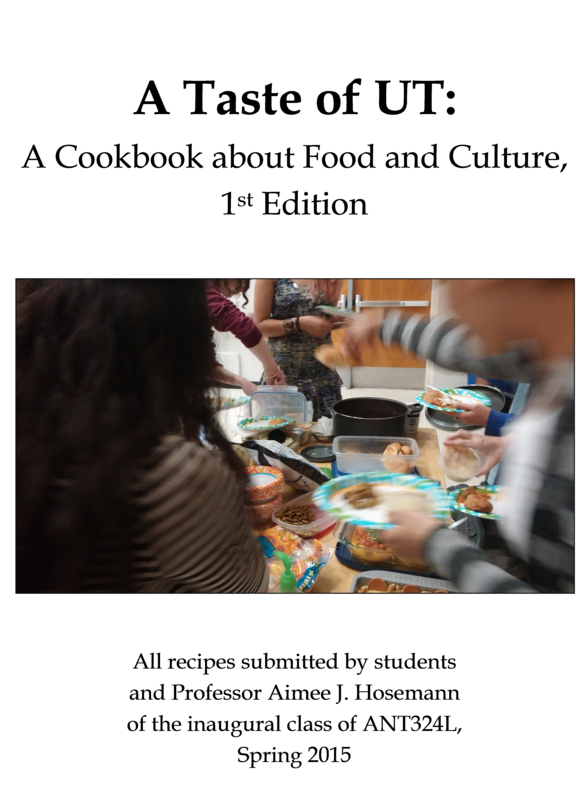 Finally, the chapters in Section IV: Food, Identity, and Consumer Society discuss identity creation and how food and eating can illustrate “otherness”. Sutton and Beriss (Chapter 9) explain how place, identity, and community can be analyzed through an exploration of restaurants. However it seems that Chapter 9 would be better suited to the third section of the volume. Chapters 10 and 11 accentuate the role of language in the study of food. Stross (Chapter 10) presents a narrative of his syllabus, and highlights several innovative in-class activities. In Chapter 11, O’Connor explains how she uses food to teach semiotics with an emphasis on helping students understand the relationship between theory and method. In the final chapter, Van Esterick reviews her decades of research and teaching on food, discussing how her research informed her teaching, which in turn informed new research. She writes poignantly about the emotional reactions experienced by both scholars and students through discourse on family, hunger, health, and disordered eating. Several authors reflect that their courses on food attract a diversity of students making teaching both challenging and enjoyable as they learn from their experiences. As students grapple with how to analyze personal experience in an academic context, food becomes a tangible and emotionally charged vehicle for applying anthropological theory. In teaching anthropology courses, this is not an uncommon problem. However, this volume could benefit from deeper discussion of how to handle pedagogical challenges in the classroom. While ethical dilemmas such as students who struggle personally with issues such as food security and eating disorders are regularly mentioned, precisely how these problems are resolved in the classroom is largely absent (with Chrzan’s chapter a notable exception). This volume will be of most use to graduate students and professors who are preparing to teach new courses, or wish to infuse their existing courses with new assignments, activities, and articles. Nearly every chapter includes expansive reference lists for readings and films, and many authors list website URLs for resources and classroom activities. A major strength of the volume is that most authors describe a specific assignment used in their course that is subsequently listed in the appendix. These assignments are excellent additions to the volume, providing easily adaptable teaching examples for readers. This month, the Food Pedagogy Series is pleased to offer a special pair of interviews. Doctoral candidate and instructor Aimee Hosemann was recommended by one of her students, and both Hosemann and the student, Clara Broomfield, agreed to be interviewed about the class. We will hear first from Hosemann, and then we will hear from Broomfield for a student’s perspective on the same course. In this interview, Hosemann discusses the use of commensality practicums and a class cookbook in her course “Food and Culture” at the University of Texas at Austin. She also reflects on professors’ responsibilities when discussing their own diets, and the challenges of teaching as a doctoral candidate. LRM: Before we start talking about the course, I would love to hear a little bit more about your work. AH: My work is linguistic and sociocultural anthropology with a Brazilian indigenous group called the Wanano/Kotiria. I’m specifically interested in women’s expressive practices. About a year and a half ago, I was drawn into reading a bunch of stuff by vegan ultra athletes. I noticed how many professional athletes were moving into vegan or whole foods plant-based diets. They were telling stories that sounded like religious conversion narratives: they reached a moment of crisis in their lives, and found plant-based diets. They’re very powerful in the same way that religious testimony is. What started as a hobby turned into what I’m going to focus on for the next couple of years. LRM: Looking at your course description, I noticed that the last statement says you will focus on “how flows of dietary images and discourses shape race and ethnicity, gender, social class, and other identifications.” I found that an interesting phrasing, because it seems that many food-related syllabi invert that—they look at race, ethnicity, gender, and social class shaping dietary practices rather than the other way around. Can you talk about that phrasing in particular, and about your goals for the class more generally? AH: That’s such a great question! One of the things I’m interested in is how all manner of things have semiotic content that people interpret. Thinking about food as a globalized thing, you can imagine food and images of food moving around in different social networks. When people take those things on, there’s something appealing about those objects. I think about how people respond to these things, and how that shapes some of their ideas about themselves. I think it would have worked equally well if I had inverted those things, but I guess I’m trying to play with the concept that dietary practices, and talk about dietary practices, are enactments of something—like the discourse-centered approach to language and culture, where language, culture, and society aren’t necessary the same thing, but they are constantly reconstituting each other. I think that that plays in really well to my general goals for the class: more than anything, I want the students to adopt an anthropological mindset, and learn to think about things, ideas, and people as reflective of, and constituting, networks of relationships. The way that I wrote the description and my goals for the class work hand in hand with each other. LRM: Does that approach shape the topics you address or the order of the content of the course? AH: They did, sort of. I tried to think about things that students had ready experience with. So we have readings about coffee, and a discussion about the Paleo diet and physical anthropology evidence for or against it. Then, there is another structural element to consider, which is that we used Gillian Crowther’s textbook Eating Culture. I looked in that book for inspiration about things that students might really want to know, and things that are my interests—for example, readings toward the end of the semester, about vegan sexuality, about lacking food when you’re in a detention center a migrant, or the cultural and environmental impacts of the BP oil spill. These were things that I was really interested in at this particular moment. LRM: It sounds like you are working to keep the content fairly current—these are very current issues, migrant detentions, and the BP oil spill. AH: Yeah, and those two things especially, it’s not too difficult to think about how they would apply to a student body that largely comes from Texas. The oil industry is absolutely integral to a lot of people’s livelihoods here, and then in Texas we have some family detention centers that got a lot of media attention because they were not doing a very good job of housing people in a humane fashion. I really wanted to be able to think about those things, and the lens of food and food practices is a way to sneak at controversial topics. LRM: Did you feel like that was effective, like you were able to broach more controversial topics successfully this way? AH: I think it definitely helped. One of the things that I hammered constantly in my class was the need to understand where our food comes from, and how it is interrelated with other things, like immigration. 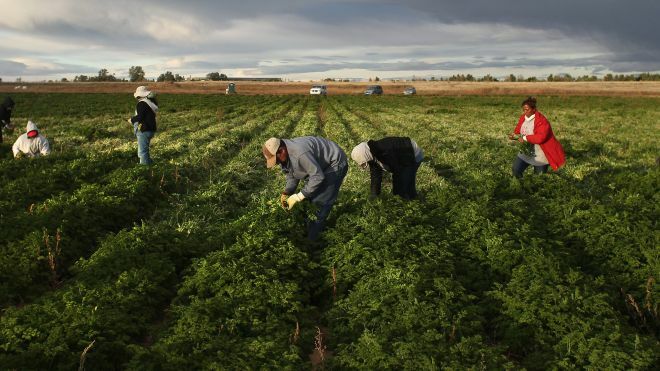 If people want immigration reform, they need to be willing to pay more for their tomatoes. In class, we talked about: How important is a tomato to a particular cuisine? Would you pay for this cuisine that includes tomatoes, and what happens if you only want to be able to pay very cheap prices for your tomato? Who actually paid for that? LRM: I want to back up a little bit: how big is the course, what kind of students enrolled, etc.? AH: The class had 46 students. They were a lot of upperclassmen. It was not meant to be a super high-level course, but it assumed that students had some background in anthropology. Anthropology students got the first seats, then people from other departments. There were a number of ethnic and racial backgrounds represented, as well as traditional and non-traditional college students. Many people had worked in some kind of food-related industry, and had some experience with the work of food. That gave us the ability to really talk at a higher level about what the world of food is like. LRM: 46 students…that’s a pretty large class to think about eating together. Could you talk a little bit about the physical structure of the class? AH: We were in a relatively small auditorium, with about 80 chairs in it stadium-style. When I was lecturing, I tried to move around the room and get people to move around in their seats to engage. For some of the people down in the front rows, they never saw some of their classmates in the back, so they didn’t always know who was speaking. So I tried to move around as much as possible, and sometimes let them take over the conversation and turn their backs on me, and look upward in the classroom. Our eating sessions helped that, because then people could move around a lot more, and talk to different people. LRM: You’ve mentioned this “commensality practicum,” and the student who recommended you spoke specifically about this a fantastic aspect of the course. Can you tell me more about it? AH: It’s actually something I drew on from my high school newspaper class. We sometimes had what were called “interpersonal skills test,” which were times to kick back and let the stress melt away for just awhile. I always thought that was such a good idea, because we could talk and have fun together, and get to know each other as newspaper staff in a different way. My class was scheduled at noon, and because it was a food class at noon, there had to be some way to integrate actual food on a reliable basis. I was really taken by the idea of having something like a discussion period every so often so that if there were things they wanted to talk about, they had a chance to do that. LRM: Did everyone bring food to share, or their own lunches? AH: Everyone brought food for themselves, or somebody might have a little extra something to share with people who were close by. We had a separate day, when their recipes were due, that people made food to share. They liked that so much that the next week we had class brunch. LRM: Was there a structured discussion topic for the commensality practicums? AH: I would start out with an idea. One time, we talked about what kind of structure we might like our class cookbook to take on. Another time, I asked them how they feel about the concept of food as a human right. I would think about something that was in the air, and then ask them to get a conversation going. They would take it from there. LRM: You mentioned a class cookbook. Can you tell me about that? AH: Every student had to include a recipe. It could be for anything that they wanted, it just needed to be something that they liked, and I requested that they provide cultural or familial information; pictures if they wanted them; information on special kinds of techniques or shopping, and to really have fun with it. And some of them were absolutely amazing! Some were written bilingually, in the home language and in English. Beautiful photography, beautiful stories. People scanned and took pictures of the original recipe cards. They submitted them through Canvas, our course management site, and I am compiling them into a single document that they will all get electronically. LRM: It sounds like they were excited about it. AH: They were very excited about it! Even if they didn’t show it in class, it came out in the writing. They talked about what the food is like, and how meaningful it is to them. I could really feel the excitement in their submissions. LRM: Could you talk a little about a couple of the concepts you really wanted to get across in the course? AH: There were a couple that really took on lives of their own in the course. First, “What is the idea of gender in relationship to cooking?” Professional cooking and domestic cooking are valued very differently. They really got engaged in that, especially thinking about it in relation to coming up with recipes that were good enough for class. Often, they went to female family members to ask for things, and it gave many of them a new way to think about what was happening when people were cooking at home for them versus when they were eating at restaurants. Another was food as a marker of health and a marker of security. Because we were really trying to get to an understanding of health as something that is subjective, and even though there are things that we can say about health that seem like they’re pretty objectively true, that objectivity actually hides a lot of cultural context. Thinking about food security and how it relates to issues of health, one of the things we discovered in class conversation is that the university has a lot of food available. They could conceivably eat just about any time they want to, but it’s not actually that accessible to them, either because of time or budgetary constraints. The things they want to eat are too expensive or too far away. Even though there is food around, as college students—even at this university that considers itself a Public Ivy—a lot of them are at least temporarily food insecure. LRM: Can you talk a little about how you bring in linguistic anthropology to teach food? AH: I love to use linguistic anthropology with food! And I’m a big fan of Jillian Cavanaugh’s work on salami, and her work with the documentary processes around food production. There’s a piece in the Journal of Linguistic Anthropology, “What Words Bring to the Table: The Linguistic Anthropological Toolkit as Applied to the Study of Food,” which details how anthropologists who do linguistics have found themselves doing food, and about how those things meld together. You can’t talk about food without talking, and the way that people talk about food—the how, the why, the when—all of these are just as important to the cuisine as the food itself. We spent a lot of time thinking about how what people say reflects ideas about food and their bodies, and what they have access to, what’s appropriate. That adds a whole level of analysis, and a lot of richness. LRM: Did students latch on to the importance of language in relation to food? AH: I think they did. One of the pieces we looked at was Paugh and Izquierdo’s “Why is This a Battle Every Night? : Negotiating Food and Eating in American Dinnertime Interaction” about dinnertime arguments over food. That piece is so rich because the transcripts are just beautiful, and you really get the sense of the dynamic that’s happening. I was able to show them, by talking through these transcripts, how this discussion about food is emergent but also plays onto particular family histories. LRM: The student who recommended you commented that this course integrates many “culturally relevant internet sources and films.” I wonder if you could talk about those? AH: What with having a Facebook or Twitter feed, I saw all these interesting things. I’m always looking for interesting snippets to show people the connection between journal articles and real life. Then, I got a Netflix account last semester, and went through their entire holding of food movies. 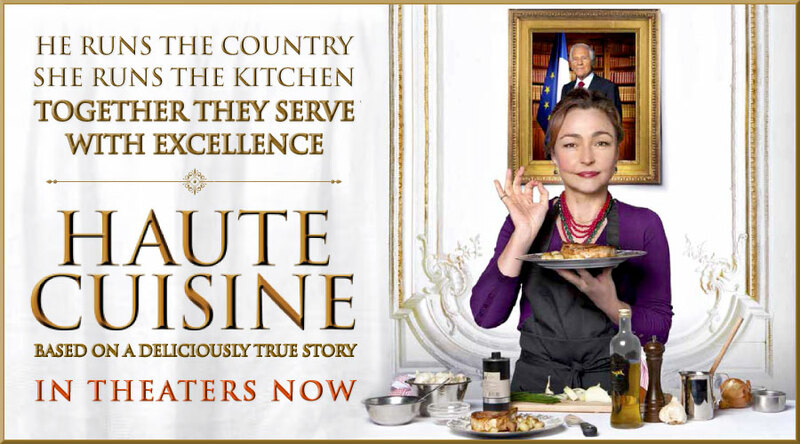 One of the hits of the class was the French movie Haute Cuisine, because it’s such a beautiful depiction of the gender issues between a private home cooking, and high-status chef cooking. The food photography was beautiful, the talk between the characters about food was beautiful, and it just really nicely tied together a lot of things in the class. LRM: Were there any other films you felt were particularly successful? AH: A Year in Burgundy was good. We watched that while we were having brunch, and that was really cozy. Both of these movies are very cozy movies. They just make you feel warm, and want to engage with other people, and so that set a really good tone for talking, and appreciating what landscape does for food, what culture does for food. Both of those worked really well. Jiro Dreams of Sushi also went over really well. I sent out links to a lot of things through Canvas, or through our Facebook group, so that people could look at them on their own time. LRM: Can you tell me about the Facebook group? AH: Yeah! It was a student suggestion in the last few weeks of class. Some of the core members of the class got along together really well, and they really wanted to have a way to keep in touch with each other and keep sharing materials. I think about 16 members of the class have joined up now and have been trading videos and having discussions about different things. I’m hoping to use it to keep touch with anyone who takes a food course with me. LRM: Do you also incorporate those extra media items into class time? AH: Yes. Luckily with food, things come up. For example, in Crowther’s textbook, there’s a discussion of Appadurai’s work on gastro-politics, and how being a daughter-in-law in a Tamil family can be a very difficult position around food. Well, the week after we talked about this, this news story came out about a daughter-in-law who was feeling very put upon by her in-laws, and didn’t like them messing around in her marriage. She had been urinating into their tea every day for a year to get back at them. Her mother in law was so angry, and wanted her arrested or to sue her for justice—but part of Appadurai’s point with gastro-politics is that, while the mother-in-law thinks she is having particular impacts on her daughter-in-law’s food experiences, the daughter-in-law can also approach this through subversion and claim her own kind of power in relation to her family food situation. That was one that I brought in, but students like to bring things in, too. LRM: Do you feel like students’ interactions with the world changed as a result of the class? AH: One of the questions they could answer on their final exam was about something that they learned about food and cultural relationships, and what kind of knowledge gaps they had before the class started. So far, what seems to be very strongly coming through in their answers is that, for a lot of them, they hadn’t really thought of food as a cultural entity, or that it was bound up in other things. That’s an interesting thing to reflect on, because if you think of food as existing outside of social and linguistic relationships, that says interesting things about your own food history. A lot of students have starting thinking about the fact that white bread, or Starbucks Coffee, or other things that seem ubiquitous actually refer to a whole bunch of other things that they didn’t even think about. LRM: Is there anything in the course that you didn’t feel worked well, or that you won’t continue? AH: One of the things I want to do is get the class down to a size where I can have them doing journal reflections a few times over the semester. I’ve done that in other classes, and it’s one of the single most highly rated pedagogical things that I’ve done in any class. LRM: Can you tell me a little about how that works in other classes? AH: The journals are their own personal reflections, on what’s really making them angry or that they have a question about but don’t want to talk about in class. So, they write 3-5 journals over the course of the semester of about 3 pages. They submit them electronically, and then I give them fairly substantial comments so that we have an actual conversation about where they are. At the end of the semester, they have this record of how they’ve change as human beings. LRM: You’re teaching a 2-2 schedule, and you’re ABD. Do you have any thoughts or reflections on teaching these classes while also working on a dissertation? AH: I have a lot of thoughts about that! One of the things that teaching a 2-2 does, very obviously, is slow down your progress on your dissertation in certain ways. But it also is a lesson in time management. You have to figure out very quickly what your work style is. Do you need extended periods of time to work on certain things, or can you work efficiently in short bursts? That’s been really interesting, and it’s been interesting thinking about moving on to a tenure track position–because it’s not exactly going to get any easier from this point on. So, it’s been kind of a baptism by fire, and it really does make me consider, “is this something that I actually want to do?” On the positive side, teaching things that I’m very interested in has been actually really beneficial for my research in a lot of ways. The students get excited about it, and they ask a lot of questions, and we have really good conversations. And seeing people who are just getting introduced to my work, and find it interesting and ask me questions, then gives me new things to write about. LRM: Do you talk about your own work in your classes? AH: I do. I trend vegan in my own diet, and there are particularly strong reasons why I feel that way, and I will talk about them. I also have sort of a complicated worldview about food, because I am also in favor of responsibly hunting. I talk about the complexity of that, but I also try to shy away from talking about my own dietary practice too much, until a student asks me directly what I eat. LRM: These hesitations about not wanting to impose your own dietary views—do you talk to students about that? LRM: And how did they respond? AH: They responded that they absolutely did not, under any circumstances, want me to tell them how to eat. LRM: How would you compare this to the ways some professors might advocate for local, organic, or sustainable foods when teaching about food? AH: I have heard about some programs where there is more explicit focus on local and organic food sources, and push people to shift their dietary practices that way. It does seem like a more widely accepted thing, if you were to evangelize for a particular diet. However, in another class I talked to students about this. We talked about how, once you start talking about local, organic food sources—never mind even vegan stuff—you’re often dealing with people who are white and upper middle class, and their dietary experience may be very disconnected from some of the students in their classrooms. LRM: How do students respond to that position? AH: The students themselves are very critical of a lot of the food discourses that they hear. They understand that people might think them to be good ideas and very socially transformative, but they also understand that there are people who get excluded for structural reasons. They were as openly critical of those kinds of things as I might have been. LRM: In some of the readings you’ve assigned, you touch on topics of moral judgments of obesity. Do you feel like students’ sensitivity and critiques of local food discourse is extended to the way they understand discourses around obesity, as well? AH: Oh yeah. 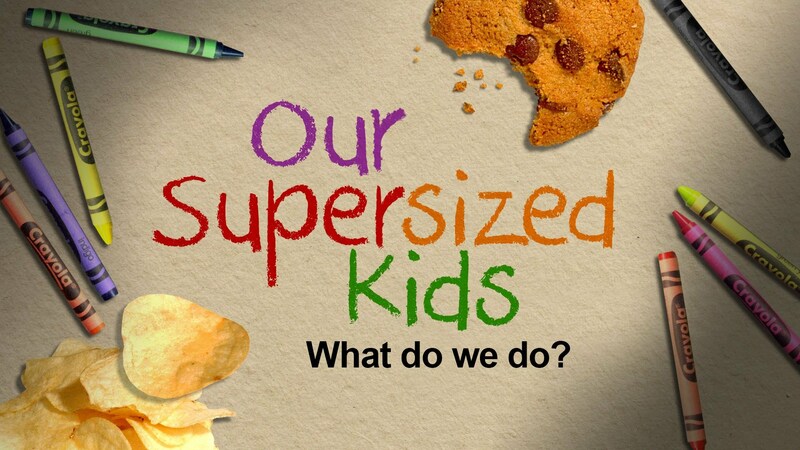 There’s a video from Spokane Public TV, “Our Supersized Kids” about childhood obesity. When we watched it, they identified a lot of things that even I hadn’t noticed. For example, while there is talk about the unhealthfulness of obesity, there is also a lot of bullying of kids who are perceived as being unhealthy. A lot of it is framed as their fault. They caused it by virtue of being obese and unhealthy. If they would change themselves, then everyone else would change. That’s a very common logic that underlies a lot of victim blaming. The students were really able to identify those very quickly. LRM: Aimee, thank you for taking the time to speak with me. This seems like an excellent course, and I am excited you’ve opened your teaching to commentary from a student, as well. It will be wonderful to have varied perspectives on the same course. 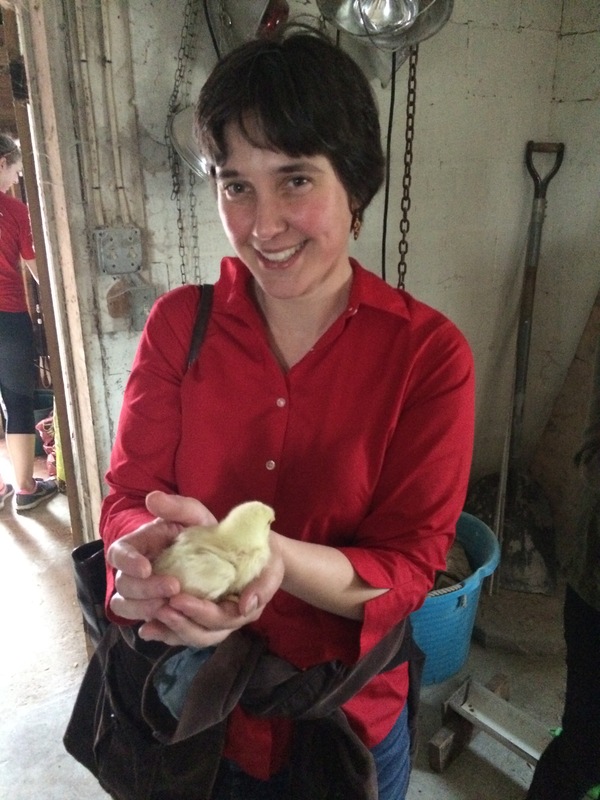 Welcome to the inaugural interview of SAFN’s new Food Pedagogy Interview Series. Each month, we will feature a food scholar who teaches a course related to food or nutrition. They will share tips, tricks, and cautionary tales from their classrooms. If you would like to participate, or would like to nominate an excellent instructor for the interview series, please email LaurenRMoore@uky.edu. 2015 kicks off with an interview with Susan Rodgers, Professor of Anthropology at The College of the Holy Cross in Worcester, Massachusetts. Rodgers was the 2013 Carnegie Foundation for the Advancement of Teaching/CASE Massachusetts Professor of the Year. Though Rodgers’ own work focuses on the politics of art and literature in Indonesia, she has developed a challenging and provocative food class for first and second year students at her college. She speaks here about the course, successful components and cautionary tales, and why anthropologists should have high expectations for introductory classes. SAFN members can access the syllabus Dr. Rodgers discusses here through the SNAC 4 resource page. Lauren R. Moore: Can you tell me a little about how this course got started? Susan Rodgers: First of all, I’m not an anthropologist of food. My work and publications are on very different things. I’ve worked with the Angkola Batak people of Indonesia since the mid 1970s on issues of the politics of print literature, and minority arts in Indonesia in general. I came to Holy Cross to help the school set up a new anthropology program in 1989, after teaching at Ohio University for 11 years. About 7 years ago, the college made me the Garrity Chair, which is a rotating, endowed professorship [during which] you have to design a brand-new course that speaks to issues that the Garrity family was interested in—social justice issues, basically, and fine liberal arts teaching with challenging texts. At the time, I was using a lot of Paul Farmer’s work in a freshman seminar. I was really impressed by how well Paul Farmer’s work teaches to first and second year students, so I decided to create this Food, Body, Power course. It’s an anthro of food course, but undergirded very explicitly with Paul Farmer’s understanding of the structural violence of poverty. I ask students to read Farmer pretty seriously and then see if his understanding of structural violence can be applied to issues of food insecurity both domestically and worldwide. He himself hasn’t done that yet to any extent. But I imported the theory from Paul Farmer, and based the course around that. So that’s the origin of Food, Body, Power. I had taught a more broad-based Anthro of Food course for several years before this, but Food, Body, Power is an offshoot. LRM: One of the things that drew me to this syllabus in the SAFN materials was how you’re really tackling complex topics and serious readings in a 100-level class. Does the institutional context at Holy Cross relate to the kind of syllabus you’ve created? SR: Holy Cross very much makes it possible. Holy Cross is a small, highly selective, liberal arts college. We’re like Vassar and Bates and Williams and Amherst…that range. We do get, in general, very, very good students who expect to work hard. So it doesn’t shake them up when they see, for instance, 5 monographs and a whole bunch of journal articles in an Anthro 101 syllabus. That’s kind of the Holy Cross thing. But, maybe because of my 11 years teaching at Ohio University, I feel that at almost any four-year institution, we can take our first and second year students very seriously, and pitch a course like this to them. I think they rise to the occasion. You know, in philosophy, the professors are asking their first year students to read very tough material. They don’t flinch from that. When students take a chemistry course, they’re asked to do some pretty challenging thought-work. So, I feel that this has some translatability. The difference, if I was teaching back at OU, is the size of a class. Here, our 100-level courses are either capped at 25 or at 19. And of course you can ask the students to write a lot more if you’ve got a class of that size versus teaching to 50 or 75 students or even more. The professor could die grading papers. This is a pretty writing intensive course, as most of mine tend to be. If I was teaching it to a larger class—above 25—I would have to scale down the amount of writing that students do. But some aspects of the current version I think would work really well at any institution. LRM: Weeks 12 through 14, I see they’re doing group presentations. Can you tell me about those? I always like to have students do teamwork as they go through the course. First of all, there’s four weeks of a condensed anthro of food course at the beginning. They read many chapters from C. Counihan and P. Van Esterik’s Food and Culture anthology. Then they read Paul Farmer, and then Sidney Mintz’s Sweetness and Power, and Psyche Williams-Forson’s Building Houses Out of Chicken Legs. So, they’ve already done some pretty heavy-duty things. Then, we have a section where I ask them to apply what they’ve learned, à la structural violence and so on, to issues of famine. All the way through the course they’ve been divided into 5-person teams. I have little assignments that they’ll do. After they’ve done all of that, writing essays and essay tests all along, I have those teams really do something, in terms of producing knowledge for the whole class. They have to meet, pick a serious food insecurity issue from outside the United States, research it together, and then put together a 25-minute lecture on their selected issue. For instance, child stunting in India: what causes it? After they’ve done that lecture, they take that same critical lens and work together in their teams to identify, address, and lecture again on a food insecurity issue in Massachusetts that also has relevance for Worcester. And that’s at the end of the course. And that, I think, could be translated to almost any institution, because students just thrive when they’re asked to do teamwork…but not just to do it, but to actually lecture in the class. One thing that makes this helpful is our reference librarian, who runs a 50-minute class for us in the computer-assisted classroom about how to find sources. So, I know they’re armed with the ability to find good sources. As a follow up to these lectures, each student picks a paper topic that has been generated by their team reports, and then they (individually) write a 7-page paper on that. LRM: Can you give an example of a memorable project? SR: For some reason, one whole class was fascinated with South Sudan. One of the teams did a really good job looking at basic infrastructure problems in the country, like transferring food from one city to another. That team had a couple of economics majors, and they were able to bring their expertise to the class lecture, which was trying to explain why food insecurity is so dire in Sudan. From our readings, they were already alerted to the problem of how warfare violence can lead to famine, so they brought that in. LRM: Do they also get excited about the local topics? SR: One thing I’ve done is ask the Executive Director of the Worcester County Food Bank to come to class and lecture about food insecurity in Worcester County. South Worcester, right down our hill, is one of the most seriously impoverished parts of Worcester. I mentioned it might be something they could look at. That sparked their interest. One small group last spring did such a good job! They decided to see how food, in a very generic sense, was portrayed in two quite contrastive high schools. One was in a fairly impoverished part of Worcester, and they also picked the public high school in Weston, MA—do you know about Weston?—it’s so prosperous. It’s one of the most over-the-top wealthy parts of Massachusetts. They did it as an experiment. They wanted to see what the school websites told us about food. In the Weston public high school, oh my goodness. They had a cafeteria that was basically like an organic cafe. It would provide all these different, extremely interesting, sometimes even literally organic meals; very internationalized, sophisticated cuisine; guides for parents as to how to encourage their sons and daughters to eat healthful food and everything. It was a very elaborate, upper middle class take on healthy food and why it’s good for us. 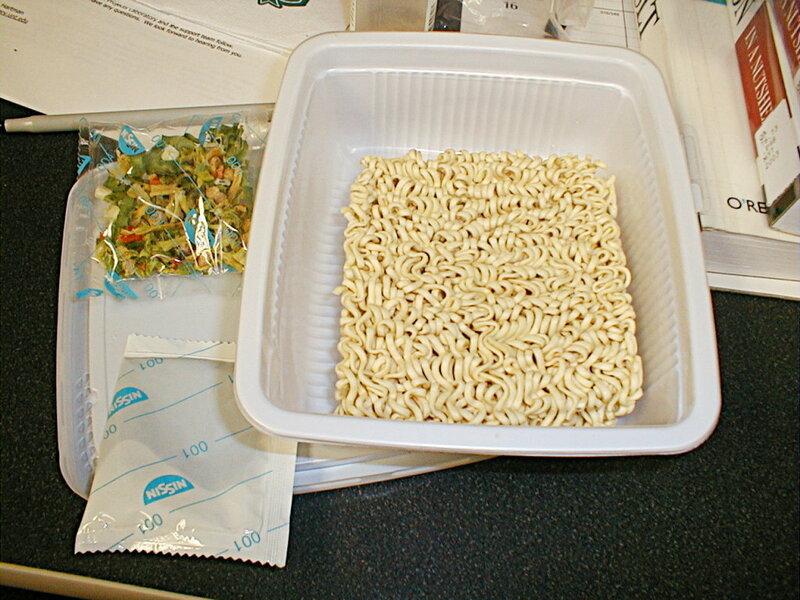 Then, the students were able to contrast that with the almost blank information about food—and relatively little outreach to the parents—in the particular public high school in Worcester. They were also able to follow the weekly menus and look at the tater tots versus the kale salads and so on in the two contrastive high schools. That was really eye opening for the class, I think. We could discuss issues of class privilege and worldview and class-shaped “taste,” in the Q and A part of the students’ lecture. LRM: Have you had things that haven’t gone as well, that you’ve elected not to do again? Do you have any cautionary tales that have come out of this course? SR: There is one cautionary tale I could pull from my experience. When I taught the old version of this course, the more generic Anthropology of Food course, I took one class period (of a 3 days/week class), and met outside the classroom, and together we walked down the hill into south Worcester. I asked them to walk around this little strip mall, with a Wendy’s hamburger joint, a cigar shop that has a few vegetables and a lot of snack foods, and a very cheap Chinese restaurant. I asked students to walk around for 40 minutes with a field notebook, and observe the food scene. The next class period, two days later, we talked about it. That kind of fell flat because the students really needed more background on Worcester before that would make sense to them. I think in theory it was a great exercise, but we just can’t assume that they really know much about the local community in terms of SES and class and history. It’s very important, if you’re going to understand the food scene down at the bottom of our hill, you’ve got to understand the history of the Irish American immigration to that very spot, and the movement of the Irish Americans out to the suburbs, and the ethnic composition and poverty issues now in that area. I hadn’t told them much about that. If I were to bring that back, I would really nest it within a couple lectures—and maybe students’ own web investigations—on Worcester and social class. LRM: That’s a good point. One of the things I’ve found when talking about food with students, it can easily devolve into class-based stereotypes or normative judgments. I wonder if that’s something you face or if you have any strategies for overcoming it? SR: I think probably anybody who teaches almost any topic in anthropology encounters this. One of the ways I deal with this is with the readings during the first four weeks of class. For example, this article makes such a hit. It’s really tough, and as the teacher you really have to walk through it point by point, but Alice Julier’s wonderful article, “The Political Economy of Obesity: The Fat Pay All,” really makes students think about their own social class positionality. What Julier ends up saying is that obesity works for the elite in America. It provides us a population of workers who the upper-middle class can look down on, make fun of, and underpay. Obesity also works in a sense of blaming and shaming people who aren’t at fault for their problems of overweight. They should be dealt with as people who are being victimized by the social structure, but the way pop culture works is that we can’t see those social structure dimensions, and we look at the personal and think it’s psychological. Julier sets all that out, and then I take a whole 50-minute period to discuss that one article after the students have read it carefully with reader’s guides—I always give them a reader’s guide. Then, we can talk about social class, and food overabundance, and body and power. Certain of the articles I use in the first four weeks, introducing the topic of anthro of food, can serve that purpose of making the students aware of social class dimensions to food production and consumption, and then they carry that through the whole course. LRM: You said you give reader’s guides. Can you tell me a little bit about those? SR: I’ve found that students need a little guidance before they plunge into a tough article or book. It makes them more serious readers if they have a list of say, 5 dimensions of a chapter to look at beforehand. So, using Julier’s article, it would be something like “What does Julier want us to understand about how social class operates in America?” I don’t want to overdetermine what they look at. Not simply asking them to summarize an aspect of a text, but having a question that kind of comes at them a little bit at a slant, that the author himself or herself would be able to answer. A lot of my colleagues in this department have found that, if you give the students a reader’s guide before they dive into reading an assignment, it makes for much better class discussion. Also, they sort of need it. When I was in college, I don’t think any of my professors gave me a reader’s guide, but I find that students appreciate some guidance from the professor. They need a bit of help, kind of a map. You really want to ask them provocative questions that are kind of fun to think about, so there’s a technique to writing reader’s guides. LRM: It sounds like reader’s guides are something you do in a lot of your classes. I wonder if there’s anything you do when teaching a food-related course that differs from the way that you approach other, non-food courses? SR: One thing I probably do more in my food course than I do in my other range of 100- and 200-level courses that seems to work well, is when there’s a really interesting article in the morning New York Times or in the Washington Post or any serious newspaper, I’ll pull off a copy. And I’ll actually make a photocopy of it for every student in the class. I pick out really well-written current stories related to the topic of that day’s lecture, and I’ll actually ask them to take 10 minutes in class and sit there and read it silently to themselves, and then relate it to the chapter or the article that we’re dealing with on the syllabus that day. That seems to really interest them a lot. Then they go out and begin to be more serious newspaper readers themselves, which is an important lesson. There’s another thing that’s distinctive to Food, Body, Power that works really well in the food class: autobiographical reflections. When I teach Anne Allison‘s wonderful “Japanese Mothers and Obentos: The Lunch-Box as Ideological State Apparatus,” after I make sure they understand what her argument is, we relate it to the their memories of the way their family prepared lunches for them at age 5 or 6. Everybody scribbles notes, and we describe it, then we do Anne Allison’s analysis and look for the structural message underneath. One thing that all of us, including me, say is that our parents would prepare our wonderful, nutritionally balanced meal, send us off to 1st grade, and then we’d trade things… a tuna fish salad sandwich for something yummier, for example. Once we all admit we traded away our nutritious lunch, we ask: what does that really tell you about American culture? Then they discover, well, individual choice is really valorized, standing up to authority is valorized. You can do more of that biographical work in a food course than some others. LRM: This is a writing intensive course. Could you tell me a little bit about the writing assignments? SR: This has four 5-page response essays. They’re not research papers… the somewhat longer essay they write at the end is more of a research exercise, but the 5-page response essays are directed to the syllabus readings. It’s to make sure that they not only understand a set of articles, but have a critical perspective on it. The best way to demonstrate that is writing. Often I’ll ask them to pair two of the articles, and what they’re doing in an exercise like that is not only showing me that they’ve read those articles in really tremendous depth–real depth of understanding—but also synthesizing it into something that’s distinctly their own. I want them to take on the voice of an anthropologist. Another thing with having regularly spaced essays: it means that they’re really keeping up with the readings. It takes a whole lot of grading time. With 25 students, all these essays, and in-class essay exams, it’s a lot of grading. But I find it eliminates the problem of a students showing up to class and not having read. If it means more grading time for me, that’s okay, because I really want them to keep up with the syllabus and to read these texts with some seriousness. One of the goals of college education is to become a better, more precise, and maybe more creative writer. I tell them this quite explicitly before they write their first essay: I’m really interested in excellent writing, and I’m happy to work on drafts in my office hours and help students become a better writer. So that’s undergirding everything. LRM: Do you have any final thoughts or suggestions for other teachers? SR: I would say they should not underestimate their students. Even for first and second year students, you can have a complex syllabus. Paul Farmer does work very well as a theoretical framework that catches younger students’ attention. A cautionary note, though: students tend to rapidly fall in love with Paul Farmer’s work overmuch, and you have to help them draw back a little bit and be a little critical of his ethically engaged anthropology – what Nancy Scheper-Hughes calls “anthropology with its feet on the ground,” – and with Farmer’s notion of structural violence and his hopefulness about structural change. Students glom onto that and want to run with it, so you have to incorporate some critiques. Students, they’re college students. They’re serious adults. I think our syllabi should challenge them at that level. Often they can rise to the occasion. But you’ve got to have structures in place to make sure you don’t lose a student along the way. Make sure students who don’t understand the readings come to office hours, that sort of thing. Very time intensive, all these nice things I’m saying! You want to make sure that once they’ve taken the course, and back they go to their normal life, they never think about food in a simple way ever again. Hopefully they’ll keep that anthropological vision of the social complexity of food. With the power element of my syllabus, I hope they think of issues of social class and social inequality, which they’re going to confront when they’re 30 years old and reading the newspaper, or maybe being a boss in a corporation and hopefully being attentive to adequate salaries for their workers. 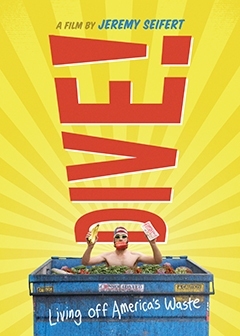 The anthropology of food… It seems like such a fun topic. It lures them in. Then you hit them with this heavy-duty economic anthropology and political anthropology, and really pretty sophisticated theory, which they begin to like. And then, hopefully, they’ll use it in their other classes, and in their larger life. I want to really change their vision of the world, maybe more in this course than in any other course of mine. In this course, I’m not worried if these students never take another anthro course. This is not only for anthro majors. You get students into it by the title, and it could be their one anthropology course. It has allowed the student to talk as a group and reconfigure their understanding of food and body and power. That’s an impact. That’s kind of a public anthropology impact on citizenship, I think. LRM: Thank you so much for you time, and for inaugurating the SAFN food pedagogy interview series!